4. Chiefly US and Canadian a poor or worthless person or a group of such people. You got to make good out of bad. That's all there is to make it with. Robert Penn Warren, “All the King’s Men”. But before talking about the topic of the issue, we should pay off the debt. The previous (double) issue was completely devoted to Irkutsk’s jubilee. We will fill in the gaps and look back on the events of the past year missed by PB. There are a lot of them: the UIA Congress in Tokyo (5-7), the Zodchestvo Festival and the UAR Plenary Meeting in Moscow (16-29), the review competition of graduation works in Erevan (30–39) and Les Ateliers of Urban Planning and Development in Cergy-Pontoise (48–54). The New Year’s news blends into the topic of the issue. This year in Irkutsk discarded Christmas trees began to be recycled into fertilizer. In the Kemerovo region the old Christmas trees are used as food for cows. So the supercilious attitude toward trash is no longer relevant. In the future we shall eat it; actually, we are already eating it. Artists help us adjust to the idea that we will live in the global dump. 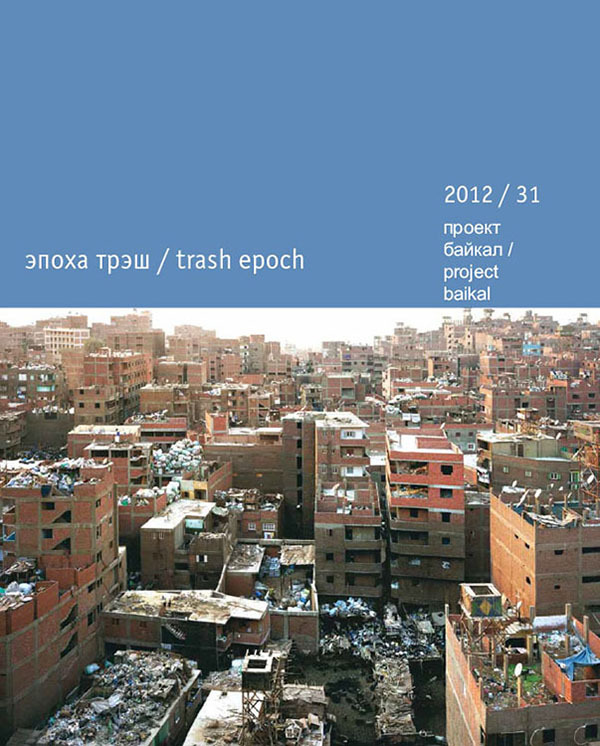 Trash Muses inspired Zhenya Kraineva and Konstantin Lidin to a diptych about trash art (66–75). The first essential step in waste recycling is to change our view on waste. In people’s minds the dump is turned into a deposit of valuable resources. The detailed text by Andrei Ivanov (90–99) tells us about a slum district obtaining a new status and turning into a historical heritage. It is very urgent to convert trash into resources. On the Earth, mountains of garbage grow twice as fast as the population. 17% of homes in Sweden are heated with garbage. Japan processes 96% of waste, Germany 95%, Poland 16%, Russia only 5%. At this moment the territory of Russia has accumulated 100 billion tons of garbage – there is scarcely any deposit of such a large scale. Waste recycling plants are a vital task for today’s and tomorrow’s architecture (102–105). The architecture itself is no longer designed for centuries. The green standards contain such an essential item as engineering redesign for dismantled or demolished structures. Instead of the philosophical principle “my house is my fortress”, the impermanence is on the agenda today. A house, like a short-life packing or tomorrow’s garbage, is now under the statement of the problem. GRIGORYEVA, Elena. trash epoch. project baikal, Russian Federation, n. 31, p. 1-1, feb. 2012. ISSN 2309-3072. Available at: <http://projectbaikal.com/index.php/pb/article/view/40>. Date accessed: 24 apr. 2019. doi: https://doi.org/10.7480/projectbaikal.31.40.